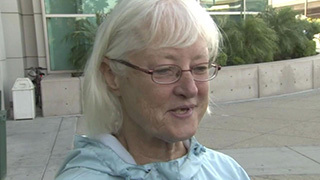 Open Jaw’s favourite serial stowaway is up to her old tricks again, and this time Marilyn Hartman, the bane of TSA and gate agents across the U.S., made it all the way across the pond. We wrote about Hartman in 2014 and again in 2015, then we took a break. But she didn’t. The 66-year-old Hartman has become notorious for her numerous attempts, many of them successful, in getting past security checkpoints and ticket checks to board aircraft. Somebody really should be paying her to test airport security systems. In 2016, she was sentenced in Chicago to six months of house arrest and mental health evaluation including several months as an in-patient at a mental health facility. In the past, she has been caught attempting to sneak through or already aboard flights without a ticket in California, Minnesota, Florida and both Chicago airports. This time, Hartman got past TSA screening at a domestic checkpoint at ORD, then took a shuttle to the international terminal. The following day she managed to evade ticket checks at the gate to board a BA transatlantic flight. It was only while the flight was in the air that cabin crew discovered she didn't have a ticket. She was arrested on landing at LHR and sent back to Chicago, where she was charged with felony theft and a misdemeanor charge of criminal trespassing. The airport promised a full inquiry -- yet again. "We are working with our law enforcement partners to support a comprehensive and thorough investigation, while continuing to maintain the highest levels of security at O'Hare Airport," said Andrea Huffman, spokesperson for the Chicago Department of Aviation.